Liddi hit an RBI double today! In the first inning I turned off my TV and decided it was a better idea to take a nap than watch the continued demise of our struggling Mariners. In the first inning Dustin Ackley got aboard on a passed ball after striking out. Ichiro Suzuki hit him around to third base with a single and I thought the M's were in business early. The monkey of 30 or so consecutive outs in a row was officially off their backs and we were primed for some offense. Jesus Montero came up to the plate and all of a sudden I realized why I had been so irritated the past few days. Montero grounded into a double play to end the threat and the inning was over. Sound familiar? Well, that's been the same story all week long with the exception of yesterday when we couldn't get on base at all. So I slept. When I woke up, I saw Alex Rios on third base and Charlie Furbush on the mound. The game was tied. Awesome, the M's scored four runs and the game is tied. I didn't know that we were up 4 - 2 and just blew the lead on the previous hit. Then, the sac fly. The sac fly that would put the Sox up for good and send the Mariners on their way to their first sweeping at the hands of a team that shared a .500 record at the start of the series. Miserable. It's a whole bunch of lifeless baseball that isn't even exciting to watch. When all the excitement comes from the other team, it's not fun, it's irritating. We've gone from being excited about watching our future to watching our future look exactly like the past. Don't get me wrong, I love our team and I really think that we got something in this ball club, but there's either a missing ingredient or a bad ingredient and right now my focus is on Eric Wedge. He gives great lip service, says all the right things, works the media, but when it all comes down to it, he's a manager that has made our team worse than it was before he got it. He's a manager that is wreaking havoc in our lineup and makes too many decisions off of numbers than he does off of talent. If I were Wedge, what would I do different? Starting with Miguel Olivo, he would sit unless he was needed. Montero and John Jaso would share catching duties. Next, Chone Figgins. As soon as Mike Carp is ready to go I would finally cut him loose. He's done a bit better, but really, we're done with the Figgy episode, right? 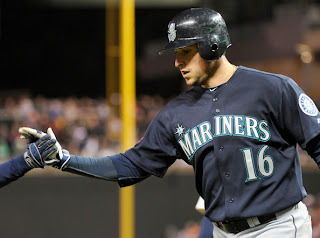 We could even cut him now and have a Casper Wells and Michael Saunders outfield to go with Ichiro. All my other decisions would have to do with pitching and I think it's a bit too early for that just yet. Maybe it's too early for anything at all, but all this Wedge talk about accountability has me going. I hear a lot about it, but I am not seeing it, at all. So we have now gone from a game above .500 to 3 games below .500 and now we move on to face the Detroit Tigers and the Prince Fielder that we couldn't that didn't pay us any mind in the offseason as Seattle desperately reached out. A team that by far has a superior offense and superior pitching and so I can't say that I look forward to the series. Our good friend Doug Fister is on the DL, so we won't be seeing him, but Casper Wells will have a homecoming of sorts as the Mariners got him in the Fister trade. Is there anything else to talk about? Nope, we're just going to grind it out and continue to get better. So says the Eric Wedge quote factory. My saying as of late, "We'll see."